A warm welcome from the landlord and landlady made us feel really welcome in this excellent village buried in the back lanes about four miles west of Bromyard. I love pubs like this, clearly a thriving local that welcomes local folk and visitors alike, and they clearly care about what they serve, and really look after their customers. It's rightfully won various CAMRA awards. 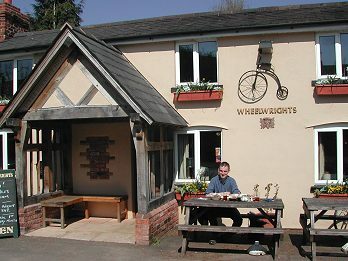 The building is 17th century, and at one time there were three pubs in the village although the Wheelwrights is the sole survivor today. It's certainly very supportive of the local community and during the warmer months hosts a Farmers Market where locals bring in and sell/barter their produce. An excellent idea. 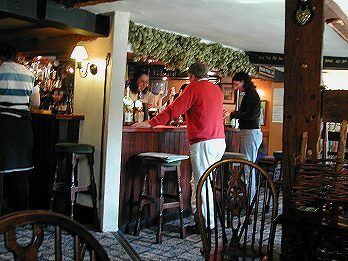 Up to five real ales are available usually including a local guest. Expect a decent pint, the landlord is definitely a knowledgeable ale connoisseur and will certainly offer informed advice if you're unsure which ale to try. Good value food is available during the latter part of the week (phone to check availability). They use local suppliers wherever possible, nice tasty pub grub. We sat out front to eat our lunch in the pleasant front garden. Folk music / poetry reading is hosted here on the first Tuesday of the month. All in all a classic country pub, in my mind one of the friendliest and most welcoming in the country. Well done!